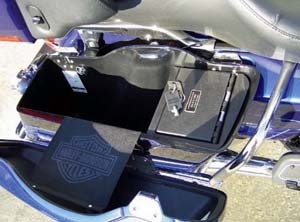 HB-114: Combination of our Organizer Tray with our custom fitted saddlebag luggage into one fantastic combo kit! 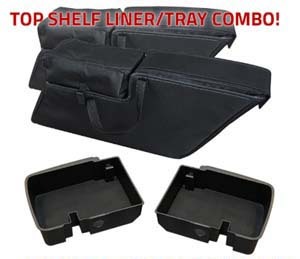 Includes two Top Shelf Trays and two Saddlebag Liners! Select model year. 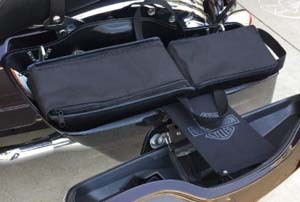 WAR-1: The Warlord Saddlebag Tray is the ONLY full-length saddlebag organization tray available. 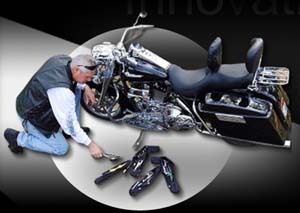 No modification required, mounts using existing mount points (fits Harley Davidson hard saddlebags. 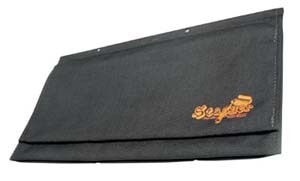 Unlike other saddlebag trays that only cover half of your saddlebag, our saddlebag trays cover the full length and width of your saddlebag. 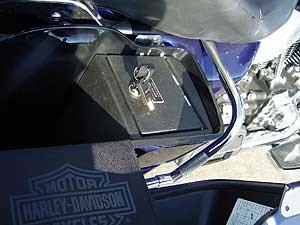 When you need to get to the item at the bottom of the saddlebag, simply lift the tray out with one hand. 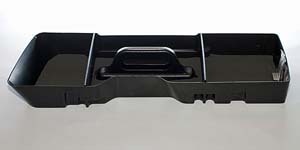 The Warlord Saddlebag tray is a must-have accessory, and the best choice for keeping your Harley saddlebags organized.The tray is made of ABS plastic and the mounts are made from polished stainless steel. 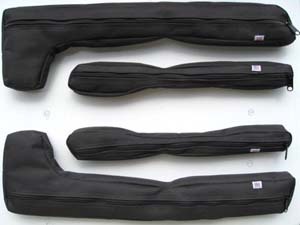 For HD hard saddlebags 1993 – 2013 including CVO. Select Left or Right side or both. 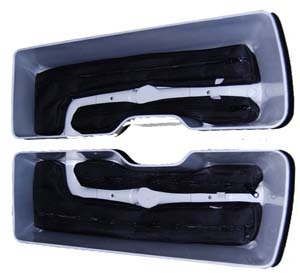 Each tray include 2 removable dividers. Does not fit in saddlebag with Lid Speakers. Does not fit Police Bike models. Comes with 1/8" neoprene liner. Depth 1-1/2". WAR-1R: Similar to above but for model year 2014 to current. Comes with 1/8" neoprene liner. Model year 2017+ requires use of earlier model year saddlebag attachment clips. 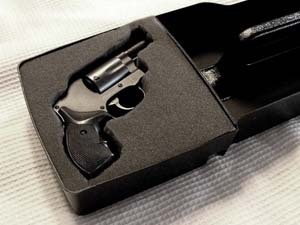 WAR-P: Pick and Place Foam Insert. Dimensions: 6" x 6" x 2". 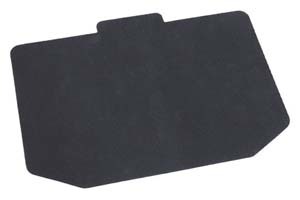 WAR-D: Two extra replacement dividers. 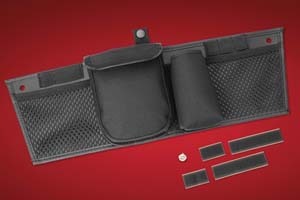 IS-1: 4-piece set for had saddlebags. 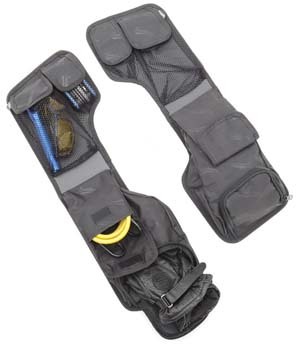 These pouches are designed specifically for use with hard saddlebags. 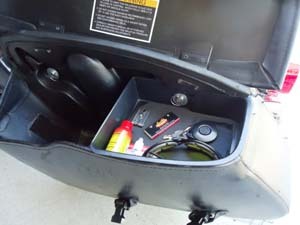 The IS-1 organizes the saddlebags so important items which are necessary to carry on the bike, but are seldom used such as tools, fasteners, first aid supplies, tire inflators and flashlights can be safely kept in an organized fashion in the bottom wells or “molding voids” of the hard sided saddlebags. 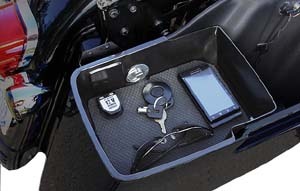 This allows for quick and easy access to other items that the rider needs on a regular basis such as rain suits, jackets, gloves, maps, articles of clothing and any other items one wishes to carry along. No more emptying out or moving around of items that are in the way to get to what you are looking for. Fits up to current model year. IS-2: 2-piece set for Road King Classic/Custom. TRK Road Kits: Many customers have asked us if we sell our pouch sets full with all the tool and first aid supplies we show on our website. In an effort to meet the demands of our touring customers, "The Road Kit" is now available. 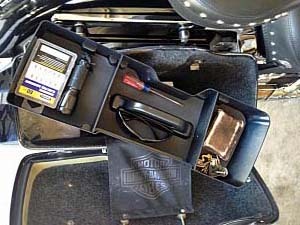 This is probably the most complete tool and first aid kit for motorcycles on the market. As with all of the other products we sell, we strive to supply quality American made goods. Many of the tools however, are quality imports because it is difficult if not impossible to find some of these items made in the good old USA. All three models of our emergency roadside service kits are pre packed in our IITB001 four piece pouch set. Just set them in the bottom of your saddlebags and go! The items listed below make up our premium set, the TRK-1 designed for riders with tubeless tires. The TRK-2 contains the same items less the C02 tire products and is for riders with tube tires. For those riders who don't do long distance touring, we offer the TRK-3, our most affordable kit. Whichever one you choose, you will have the peace of mind knowing that should the situation arise, you will be prepared. Special sale item. 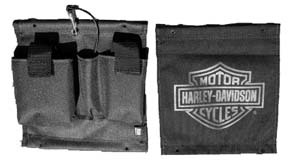 CSR-1, CSL-1: The Caddy Sack is another great product designed for use with Harley Davidson® touring motorcycles equipped with hard saddlebags. 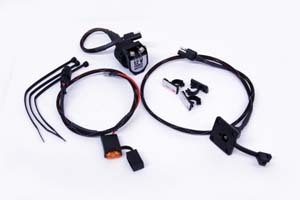 This innovative product replaces the stock saddlebag lid support webs (tethers) with tethers that offer secure storage. 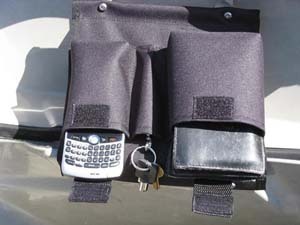 The tethers come in two styles, a three pocket for housing a cell phone, wallet, keys digital camera etc. and a large single pocket tether to accommodate a ladies size wallet, video camera, sunglasses, bike registration or whatever you choose. Riders no longer need to ride with valuable cell phones, wallets, cash and keys in their pockets risking loss through road vibration. 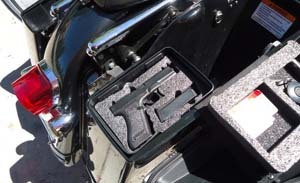 Store them safely in the top of your saddlebags and when you reach your destination they are safe and immediately accessible. Fits up through MY 2013. Dimensions: 8-1/2" x 8-1/2". CSR-1R, CSL-1R: Similar to above, but fits MY 2014 to current. Dimensions: 5-1/2" x 9-1/2". These pouches are made from “Tough Duck”, a high grade fabric selected for its strength and resilience under the harshest conditions. 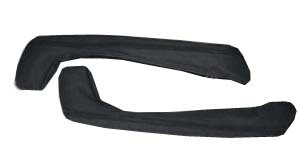 The thread is a high grade thread resistant to the vibrations of the road and the zipper is a super tough YKK # 5 zipper with proven performance. CSH-1R: OEM replacement tether with Harley-Davidson Bar & Shield, fits MY 2014 to current. 07333: Stores small items within 1993 and later hard saddlebags. 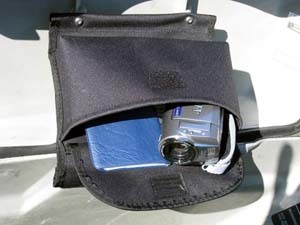 Comes complete with 1 lid pocket dn 3 smaller pockets for storage of cell phones, digital cameras adn tools. The larger front pocket is equipped to handle maps and larger items. 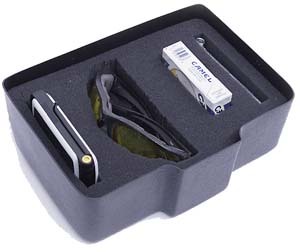 The SO-1 Organizer measures 8" x 13" and comes complete with mounting hardware. Can be mounted in either the right or left saddlebag. Easy installation. Fits up through model year 2013. 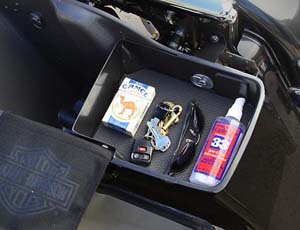 07300: Top Shelf Saddlebag Organizer. 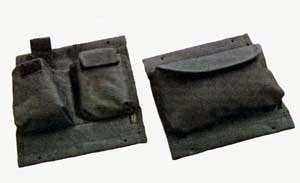 Hard Bag for right or left side bags. Fits all 2004 to 2013 models with factory hard bags. 07315-R: Locks into any stock 2010 - Present Victory Cross Country Hard bag. Available for right side only. Installs in less than 1 minute! High impact custom molded. Rubber grip floor mat included. 1 year OEM manufacturer's warranty. 07314: Similar to above but for model years 2014 to current. Left or right side. 07303: Right or left side for model years 1993 to 2003. Special order item. 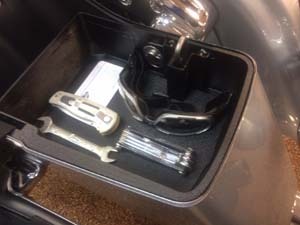 07305: Hard organizer tray for Road King Classic with Soft Saddlebags. MY 1997-2008. Left side only. 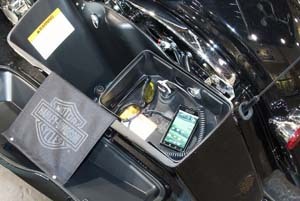 And this does NOT work in road king Custom leather hard saddlebags. 07306: Similar to above for MY '09 to '13. 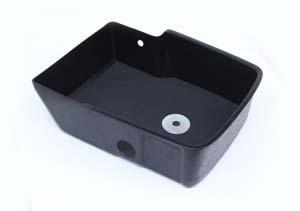 Kits includes: One (1) piece universal fit molded plastic tray, one (1) grip rubber cushion floor, one (1) Metal Replacement Washer/Parts Kit (1) instruction sheet. 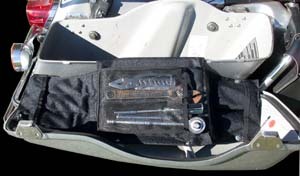 Unit will not fit CVO Hard Bags with Remote Electronic Locks, or full length fabric HD liner inserts. 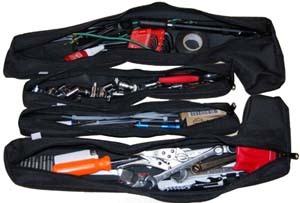 FI-K: Multi-fit foam insert kit for 07300 Hard Bag Organizer. 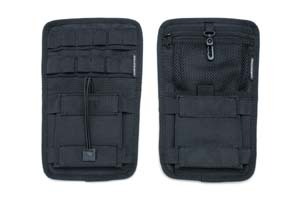 RR-M: Replacement rubber mat for Hard Bag Organizer. 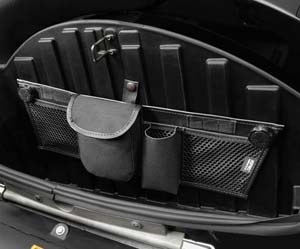 HB-GLK: Fits 07300 Hard Bag organizer for MY '04 to current. Die cut perforated to fit three different configurations of Glock handguns and one separate 10 or 11 round clip (9MM or 45 Cal.). Pluck foam section accordlingly for your model Glock handgun. Secure and lock your pistol and clip in your hardbag. Fits in right or left side. Legan in many states (check with local law enforcement in your state). May fit other brand pistols with minor faom trim modifications (modify at your own risk). LG-T: Replaces your existing saddle bag lid tether and stores all the necessary tools and accessories for roadside emergencies. 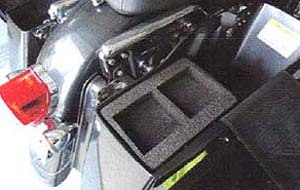 Fits 1993 and newer factory Harley Davidson hard saddlebags. Installs in minutes using your existing hardware. 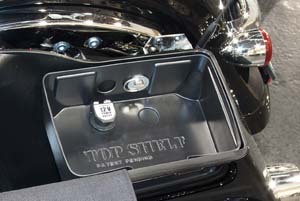 LG-L: Replaces your existing lid tether and neatly stores your road gear. No need to search your bags, everything is right on top. Easily installs in minutes using your existing hardware. 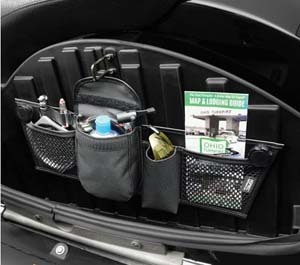 Keeps gear neatly organized and easy to access. 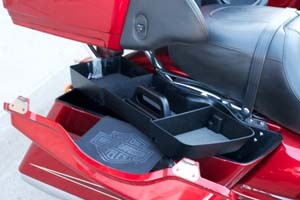 Fits 2013 model year and earlier H-D saddlebags as well as 2014+ model year saddlebags. 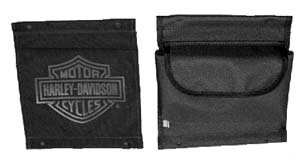 LG-P: One pouch for each saddlebag. 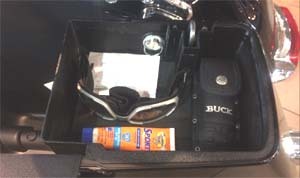 Stop searching for lost items in the bottom of your saddlebag. 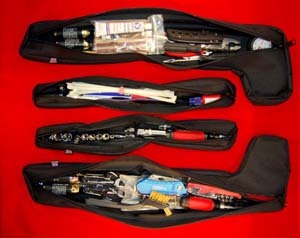 Great addition to the Lid or Tool Organizers. 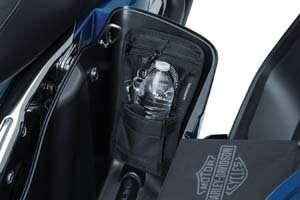 Fits 2013 model year and earlier H-D saddlebags as well as 2014+ model year saddlebags. 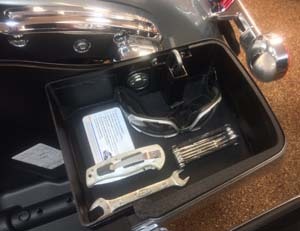 Mix and match, the Saddlebag Organizer System can be ordered with either two Lid Organizers, two Tool Organizers or the standard system with one of each. 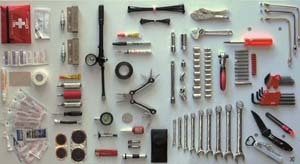 IS-1 w/Tools: The items listed below make up our premium set, the TRK-1 designed for riders with tubeless tires. The TRK-2 contains the same items less the C02 tire products and is for riders with tube tires. For those riders who don't do long distance touring, we offer the TRK-3, our most affordable kit. Whichever one you choose, you will have the peace of mind knowing that should the situation arise, you will be prepared." * Items followed with this symbol are the ones that make up our most affordable kit, the TRK-3. SDH-287: No more fumbling through that abyss of a saddlebag to find your tools, phone or whatever inevitably ends up at the bottom. 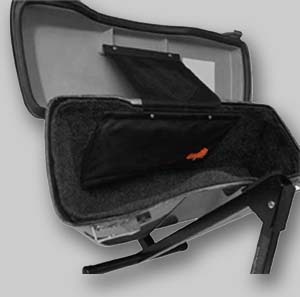 Our Internal Saddlebag Organizer keeps small items secure and easily accessible. Mounts to the inner front panel in seconds using high-strength 3M® VHBTM. 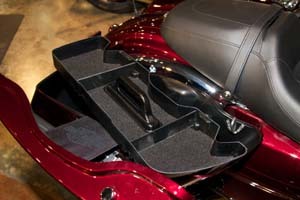 Fits: Harley HD Touring with OEM Hard Saddlebags. 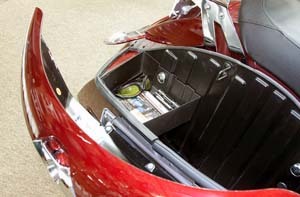 SDH-882: Convenient storage system equips the interior wall of your Color-Matched Saddlebags for easy access to keys, cell phones, maps, and gloves. 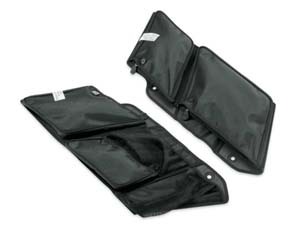 The organizer features a combination of mesh and enclosed pouches and pockets that are sized for safe, rattle-free packing. 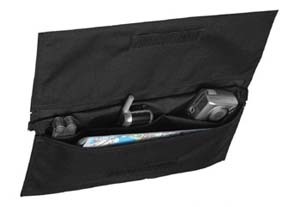 Organizer features a rigid backing that easily attaches to the wall of the saddlebag with the Original Equipment quick-release saddlebag fasteners. 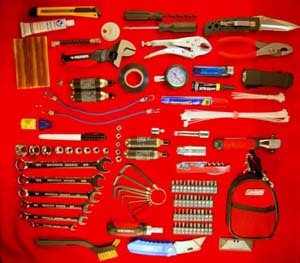 Kit includes left- and right-hand organizer. Fits '14-later Touring models equipped with Color-Matched Hard Saddlebags. 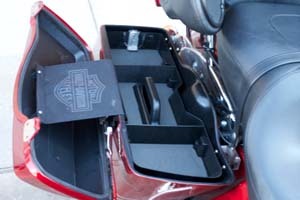 SDM-0713: Saddlebag Lid Orgnaizers for H-D Touring Bike (FLH, Road King, Road Glide hard bags). Model years through 2013. 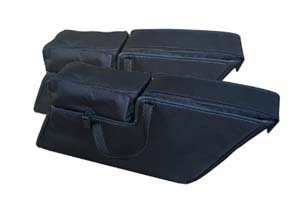 Measures: 20" x 6 5/8" x 1/2"
SDM-0757: Saddlebag organizers for FLD. Special Order item. 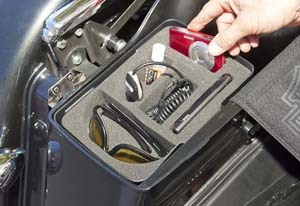 Trim, functional and smartly styled organizers fit snugly into the lids of FLD-style hard saddlebags. Organize your trip packing and maximize your cargo space using the organizer’s various closed and mesh see-through storage pockets. 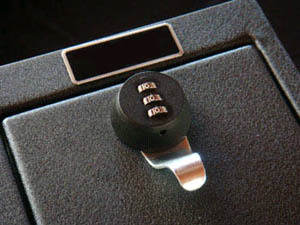 AS-16: Saddlebag Safe. 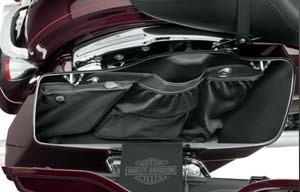 Perhaps our most unique product offering is the Harley Davidson Bagger Vault. 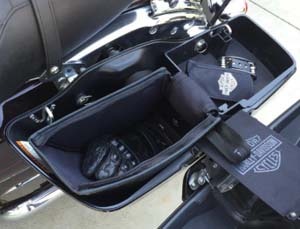 Responding to the requests of law enforcement officials utilizing motorcycles within their fleet, a custom-formed vault was created that fits perfectly within the hard storage bag on Harley Davidson's Baggers. 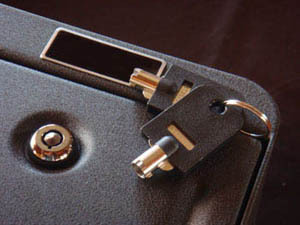 Security being of the utmost importance, the vault was designed so that once installed, the entire side bag cannot be removed without first removing the vault itself. 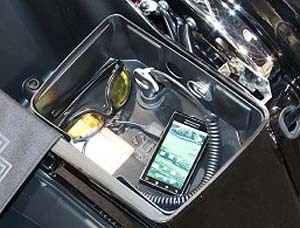 Easily the coolest accessory you could add to your prized Harley Davidson. Fits MY '94 to '07. Fits later models with minor modifications. Special Order purchase. The factory recently made the greatest design improvement since the product was first developed. 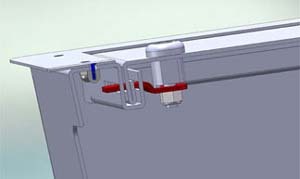 The new Triple Guard Lock System incorporates a latch design similar to the pins used in the doors of bank vaults, an overall improvement that greatly increases security. 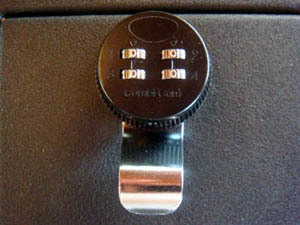 The design also includes a front channel that incorporates the lid into the body of the vault itself, ultimately eliminating stress from the physical lock. The end result: a most secure product. 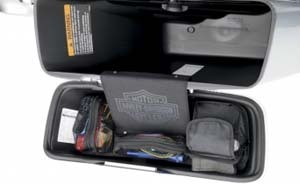 SDH-V30: The latest Saddlebag Organizer has nine storage compartments and easily mounts to the Victory Cross Country, Cross Country Tour, Magnum and Hardball Saddlebag lids of 2010 and newer models. 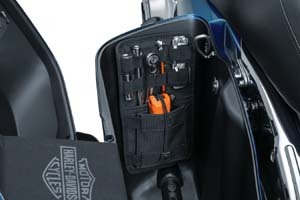 This saddlebag organizer mounts to the two existing saddlebag mount pins plus requires installation of one included screw snap and hook and loop for a secure fit. 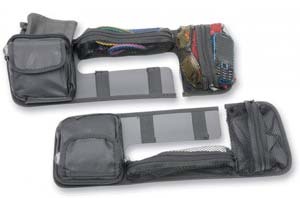 This organizer has five elastic holders, two mesh pockets, a covered pouch and one open pocket. Made in the USA. Sold as each.